The larder beetles come from the family of Dermestid beetles; commonly known as the skin or hide beetles. Larder Beetles are found worldwide and considered as household insects. Due to their habitat being not specific to certain sensitivities, the Larder Beetle Population thrives and infests anywhere it finds a sustainable food source. The larva of the larder beetle is longer in contrast to the length of a fully matured adult larder beetle; which are shorter. 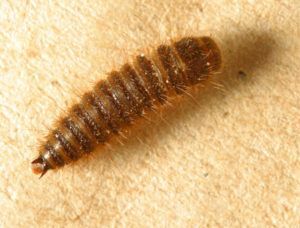 The larva has a brown color with a bright glow of red or times black setae exterior. Both of these exteriors belong to 2 distinctive kinds of these beetles. The baby larder beetle and the black larder beetle have two curved at the back, appendages which look like a spine attached close to its rear end. The appendages in the Black Larder Beetles are weaker at the curve than the other beetles. The adults are usually a third (1/3) of an inch in length. The reddish brown exterior turns into a fully matured dark brown color and boasts a broad yellow band across its upper body where it has the elytra. Each of the wings has three black dots placed in such a manner that they pose as the angles of a triangle. Coarse and clear yellow layer of soft hairs covers the ventral plate or the breastbone of the beetle cover. Other than the Larder Beetles, one more species of beetles has the same traits as they have. They are known as the lesser mealworm beetle. Both of these species found in poultry manure, rotting stuff, or other stinky or dark areas like the manure piles. Often these beetles find their homes on dead animals in wall voids and attics. During winters, these creatures make the outdoors their homes. They live in well-protected areas in the outdoors which are plenty due to a diverse natural world coexisting alongside the human habitat. In summers they tend to migrate in the households or storage facilities of animal products and grains. The main food source for these creatures is dead insects, cured and dried meats and other animal products; hence the name “Larder.” The most common of the food source though is pet food; which is why the pet owners tackle the most with these beetles in their households. The female larder beetle lays around 135 eggs when she finds a suitable place in or close to a source of nourishment. The eggs take up to 12 days before they are ready to hatch. From the egg to its death the life of a larder beetle is up to 1 ½ to 2 months. How to Get Rid of Larder Beetles? A food source is the only thing that can attract the larder beetle. 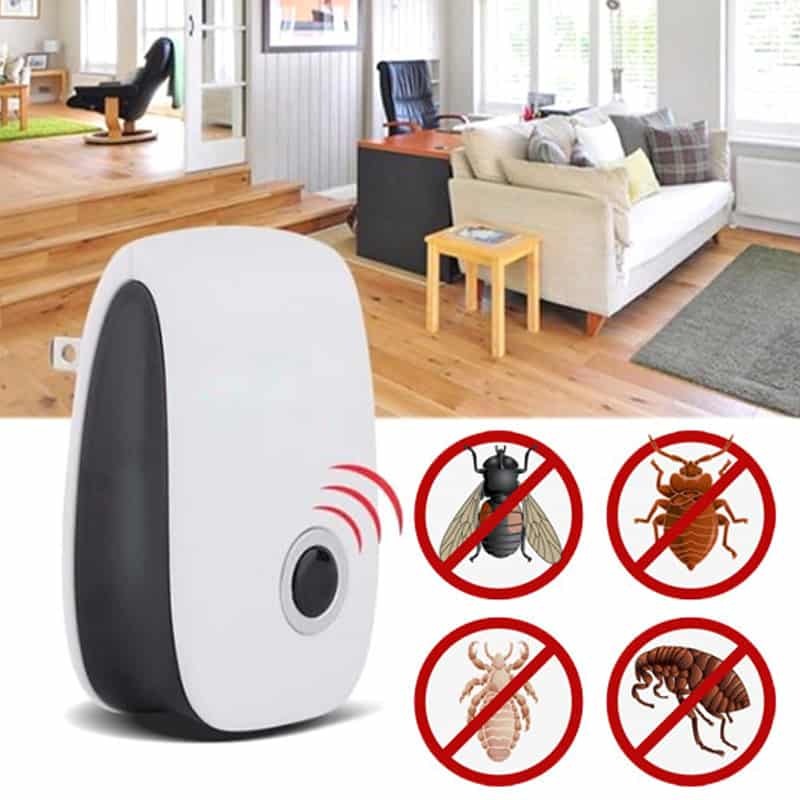 If a few adults found in a household, it does not specifically mean that there is an infestation in the house. These appearances can be random or even due to their pattern of immature beetle migration from a nearby infested place. If it is spring time, it is also possible that they are migrating indoors as per their natural pattern. Though seeing them once is not a sign of infestation, the continuous appearance of adult larder beetles is something to be alarmed by. The presence of a food source nearby is the main reason for the infestation; as without a food source, their survival is at risk. 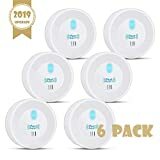 The larder beetle infestation in a pet owner’s house is usually in pet foods, and for other households, it can be found in open meats and grains. At times the infestations can also occur on dead insects and animals or small morsels of food left by rodents. 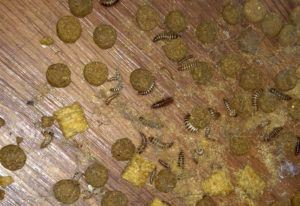 Infested pet food though is the most common occurrence in any household where the larder beetles have made a home. In farms and near livestock, these beetles can pose a real danger too. Larder beetles can infest poultry. When broken eggs, fluids, feathers and other foods mixed with manure, it becomes a very sustaining food source for these beetles. This kind of manure enhances beetle population by multitudes. Moreover, the spread and dispersal of new eggs and larvae become very easy for them, thus making them out of control. The larder beetle problem usually thought of as a small nuisance, but it can become very destructive if not taken care off. There are many ways to control this large oval insect in the early stages. When they heavily infest a place, it becomes very hard to control them. Due to their immature beetle immigration habits, they start spreading as soon as the larvae grow into adults. Getting rid of these beetles can be easy if done at an early stage. There are three different types of the removal process for the larder beetles. The first one being when the larder beetles might not have caused an infestation in a place but had a random appearance. You can physically pick them and discard them. Cleaning the house regularly, not keeping animal products in the house for long periods and cleaning the exterior of the house can help be safe of the larder beetles. The second type can be used to get rid of a minor infestation. To get rid of a minor Larder Beetle infestation the right things to do would be to clean the clutter that takes place inside or outside the house of the house. Spreading residual insecticides and sealing of all the cracks in the building’s structures to prevent the beetles from entering the house or the storage facility altogether. Other than that good bins and bags that seal well should be used to store the meats and grains as well as animal food. If a scenario gets worsened, then the best option would be to deep clean the household. There are many homemade remedies to use, put the best thing to do would be to use the commercial insecticides. These insecticides, designed for treating home invasions of such kind. Insecticides like PermaCap CS and EcoPCO WP-X are magnificent to use when the larder beetle problem goes out of hand. Both of these insecticides are good and very easy to use. It is a controlled release permethrin which gives 50 to 60 days of residual treatment. 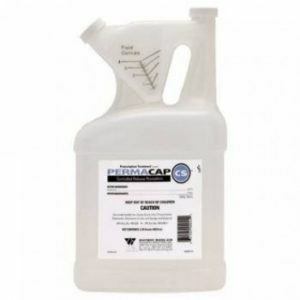 The PermaCap CS is a very user-friendly insecticide and can be used for concrete as well as mulch. It can be used in commercial and residential buildings. 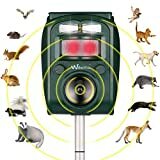 It is effective both indoors and outdoors. Along with the Larder Beetles, it can kill more than 50 types of domestic insects. The PermaCap CS can be used by diluting it to 0.5% or 1.0% and then spraying into cracks as and crevices where these Larder beetles might be hiding. 0.5% of concentration is about 2 2/3 oz. Per gallon of water and for 1.0% of concentration is 5 1/3 oz. Per gallon of water. The monthly and bi-monthly programs to follow for the use of PermaCap CS make it a very reliable insecticide. 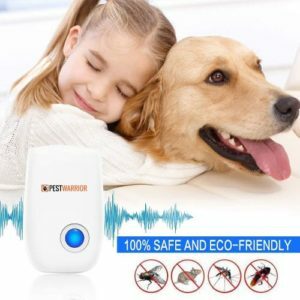 PestControl USA recommends it for darkling and Larder Beetles, thus making it one of the best products on shelves for these nuisances. PermaCap CS kills on Contact and has a residual cycle of up to 60 days. Affordability of this product is very remarkable. The main base of the insecticide on chemicals, thus making it harmful to the user. The product can damage the environment. The EcoPCO WP-X is a pyrethrin insecticide. 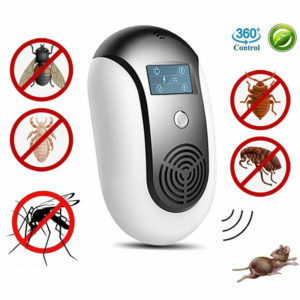 It is an eco-friendly agent that can help get rid of various insects. They come in the form of pouches which are soluble in water. It is made from a mixture of essential oils which makes it harmless to the user as well. The pouches provided by the label should be carefully opened and mixed with water to use. Maximum dilution of 0.5% is required. The 0.5% concentration of EcoPCO WP-X is about 15 grams per gallon of water. The solution should then be sprayed into cracks and crevices where these beetles are found. The effectiveness can be demonstrated in even low concentration levels. EcoPCO WP-X has a fresh odor to it. The insecticide does not leave stains. The residual quality of EcoPCO WP-X is very durable. 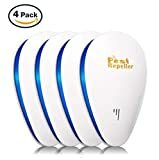 Against stronger insects, it can prove to be weak. 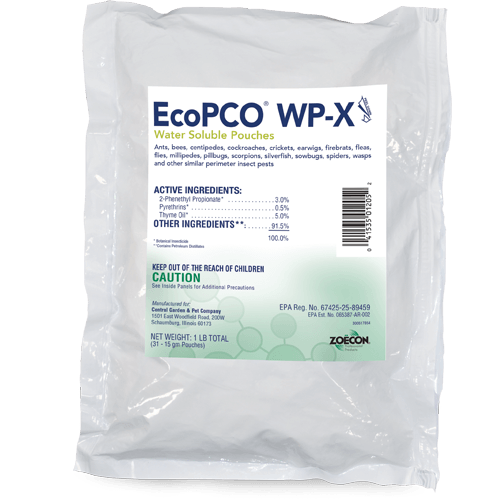 Performance wise, the synthetic insecticides can overshadow the EcoPCO WP-X. The larder beetle is a real nuisance to a household, to storage facilities and even to the collections of dead insects. These beetles are one of the many insects which have learned the way of co-existing in the Human habitat. The Larder Beetles should always be taken care of as soon as they are found infesting a place and regular treatment for these insects should take place. If not, these insects can be very destructive to a property and a human being.